Corned Beef & Potato Pierogi. The best of Irish and Polish foods combined! This is one of those posts that I almost want to start with a “why bother.” Why bother because I am posting on how to use up those delicious St. Patrick’s day leftovers a week later. Likely (aka hopefully) you don’t have any left, but perhaps you froze some of your corned beef for later. If that’s the case, then you’re in luck. But even if you need to create the filling from scratch, these are some delicious and SUPER EASY pierogi. 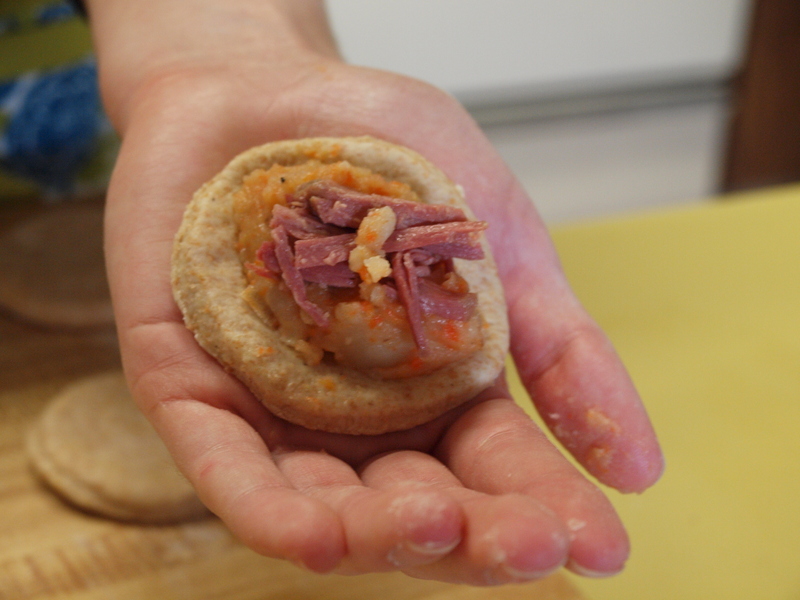 In our household the Polish (that’s me) and Irish (that’s my hubs) play nicely, so what a lovely way to combine some of our loves into one tasty lil’ dumpling. Side note: depending on who in my family you ask, some will tell you that we are German, others will tell you we are Polish. 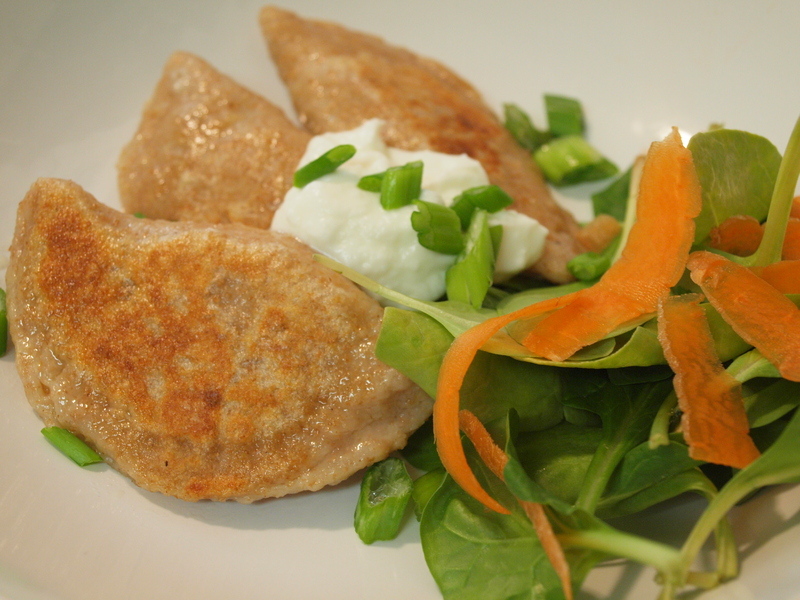 I made these pierogi a little more healthful by using half whole wheat flour and substituting plain Greek yogurt for what would be sour cream. 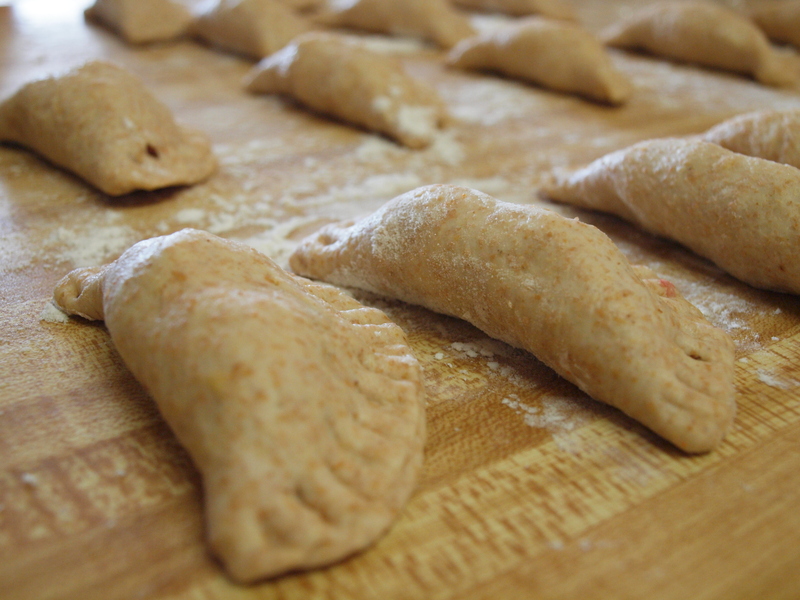 This recipe created enough dough for me to make about 40 pierogi. I boiled and sauteed about 20 of them for dinner and leftovers the next day. The other 20 I froze for a quick weeknight dinner. They need to be frozen individually first (so that they don’t all freeze together in a big clump) by laying them out on a pan sprinkled with cornmeal and once frozen throw them into a freezer bag and back into the freezer. I have a feeling I (or my hubby) will thank me for that later. Here is the recipe – be sure to comment and let me know how you liked them! 1. Combine all ingredients in a bowl using hands to mix together until a dough forms. A stand mixer with a paddle attachment can also be used for this. The dough will be very sticky at this point. 2. Take the dough out of the bowl and put onto a well floured board. Divide the dough in half. Knead each piece of dough a few times on the floured surface until less sticky but still tacky. 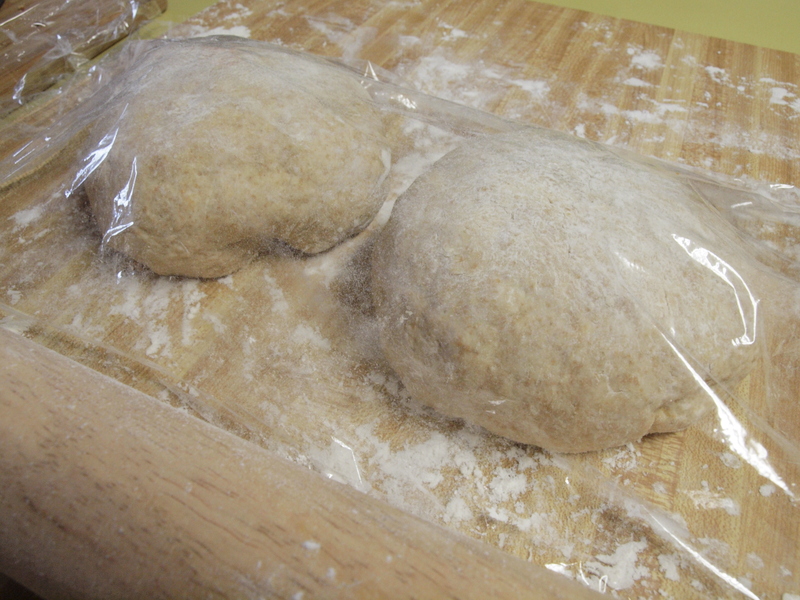 Cover the dough with plastic wrap and let rest for 10 minutes. 3. 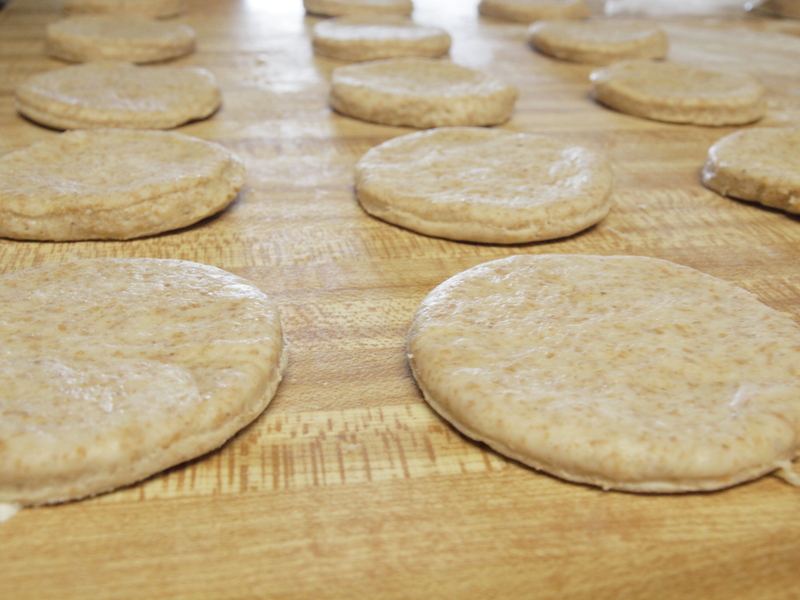 On a well floured surface, roll each half of the dough into a thin circle, 1/4-inch thick. Cut the dough using a 3-inch circle cutter. All ready to be filled with yummy fillings! I used the leftover potatoes and carrots from my crock pot that were cooked with the corned beef. Cooking the potatoes with the corned beef provided a lot of flavor to the potato filling. If you are making this from scratch you will need to boil some potatoes. 1. Caramelize the onion with some butter and olive oil. Remove the potatoes and carrots from the liquid in the crock pot and heat them up in a pan. Add the caramelized onions to the potatoes and mash together. Add the cheese and mix together. 2. Place 1 tablespoon of the potato filling in the center of each circle of dough and lay a small piece of corned beef on top and fold over. Press and seal into half-moon shapes. Use a little water to seal the pierogi. Using the tines of a fork press around the edge gently to get a good seal. Filled and sealed. Ready to be cooked and eaten! YUMM! 3. In a pot of boiling, salted water, cook the pierogi for 8 minutes, or until they float. Remove from the water and drain. 4. In a saute pan, melt some butter. Sear the pierogi for 2 to 3 minutes on each side, or until they are golden brown. Remove from the pan. The pierogi will need to be sauteed in batches. Garnish with green onion and serve with sour cream (or more Greek yogurt if you’re trying to save calories). I served this delicious dish with a green salad. Posted in Affordable Eats, Leftovers, Palate Pleasers and tagged caramelized onions, cook, Corned beef, corned beef and cabbage, corned beef and potato dumpling, corned beef and potato pierogi, corned beef and potato recipe, dough, dumpling recipes, easy weeknight meal, flour, freezer meals, freezer recipes, homemade pierogi, homemade pirogi, Irish foods, Irish recipe, leftover corned beef recipes, make ahead of time, Pierogi, pierogi recipe, pirogi recipe, Polish cuisine, Potato, potato recipes, Saint Patricks Day, swiss cheese, whole wheat pierogi. Bookmark the permalink.